With no popular mummy films in theaters for the past few years, one might get the impression that the mummy has finally taken a long-awaited voyage to join Osiris on the river of the dead. But in 2017 a new mummy film, once again entitled The Mummy. This time around, it isn't Imhotep who is causing chaos, but an immortal Egyptian queen Ahmanet (Sofia Boutella) who seeks out her mortal love, played by Tom Cruise. The Mummy is the first in the new Universal Monsters series and did not receive positive results from critics or fans.Hopefully, the future movies that will adapt the classic Universal Monster movies such as The Mummy, will be better than the first release in the series. Let's take a look at the history of mummies on the big screen, in their reign and at their lowest. Although mummies were created by one of the oldest civilizations on Earth, their characterization as supernatural menaces was largely established in the 20th century. Far from their current status as horror boogeymen, mummies were an essential part of the religious life of the people who created them. As detailed in Barbara Mertz’s book Red Land, Black Land, ancient Egypt was a strip of very fertile land on the banks of the Nile surrounded by a vast, arid desert. The Egyptians believed that the “black land” on the river banks was the realm of the living and the “red land” of the desert was the land of the dead. To insure the pharaoh’s passage into the next world, the Egyptians believed the earthly body must be embalmed, preserved in a tomb, and “fed” by a priest through religious ritual. Although many of the rulers of Egypt were mummified and preserved in such a fashion, tomb raiding was a constant threat. The Great Pyramids of Giza were plundered as early as the New Kingdom period (1570-1070 B.C.). Interest in mummies did not abate as time passed; even during the Victorian Period of the British Empire, aristocrats were consuming “mummy powder” from ground up mummies for its supposed medicinal benefits. Fantastic stories began to feature mummies as early 1699, but it was during the late Victorian period that author Bram Stoker created the first novel featuring mummies in a role as supernatural antagonists. Stoker’s The Jewel of Seven Stars, featuring a mummified Egyptian queen, was extremely controversial upon its publication in 1903 due to a violent and bloody concluding chapter. When he attempted to republish the novel in 1912, Stoker was told that he had to create a less disturbing conclusion. This new ending replaced the original in all further publications of the novel except the 2008 Penguin Classics edition, which restores the ending of the 1903 edition. The next major step in the evolution of the mummy came in 1932, when producer Carl Laemmle Jr., eager for another supernatural moneymaker after the success of Dracula, commissioned the creation of a horror film based on the concept of the “pharoah’s curse” and an ever-living sorcerer. The resulting film was called The Mummy, and it established much of the characterization of mummies. Karloff’s character, Imhotep, was a high priest condemned to be mummified and live forever for the sin of falling in love with the pharaoh’s daughter. His search for her reincarnation in the modern world and battles with the people inhabiting it formed the storyline of most mummy films made since. However, there remains one important difference between Karloff’s portrayal and the typical mummy stereotype. Karloff only appears in bandages for a few minutes in the film. For the rest, he wears less elaborate makeup and resembles a living human being in most aspects. He can speak and walk as a normal person can. The characterization of the mummy as a shambling, nonspeaking, bandaged brute was established by Universal in its later mummy films, The Mummy’s Tomb, The Mummy’s Hand, and The Mummy’s Curse. 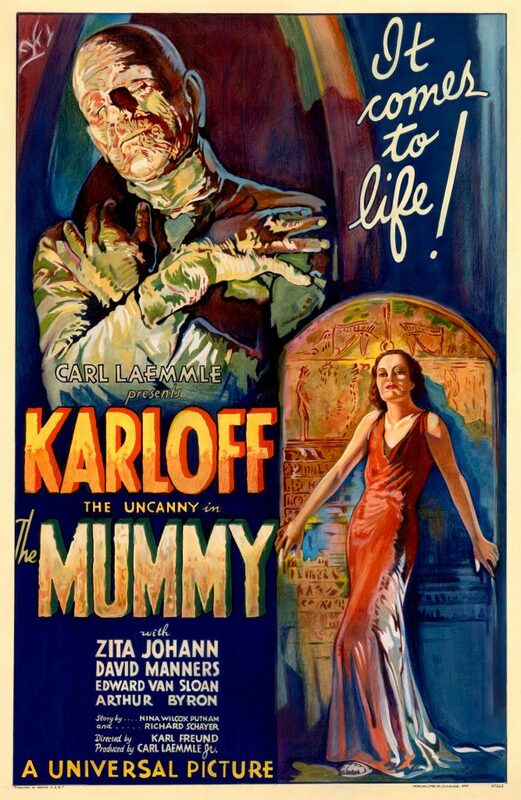 These films featured Kharis, a different mummy from Imhotep whom Karloff portrayed. Kharis always wore bandages, could not speak, only walked in an awkward shamble, but he was immune to pain and most weapons. This characterization was used in the Hammer horror films featuring mummies, such as The Mummy (1959) and Curse of the Mummy’s Tomb, and became the standard characterization of mummies in most films thereafter. In 1999, Universal released a remake of The Mummy and made a sequel, The Mummy Returns, in 2002. The Imhotep of these films was much closer to Karloff’s original than the “Kharis” stereotype; he was a sorcerer who could assume a form resembling a mortal, cast magic spells, and did not have to wear bandages throughout the film. These films were designed to be blockbuster adventure films rather than horror and favored comedy and action sequences over darkness and a sense of creeping menace. A second sequel, The Mummy: The Tomb of the Dragon Emperor, was released in 2008 but did not feature a mummy—instead using a Chinese emperor preserved in terra-cotta as its villain. Looking for some mummified reads? Check out this book list, which includes nonfiction and fiction.